I have been dying to use this palette since it arrived on my doorstep a few days ago, but I resisted until I was ready to write this post and I am not so excited to be able to swatch all of the colours and see whether this is worth the hype. I love the colour selection in this palette as it is full of warm toned shadows with pops of pink, blues and greens to add a bit of colour to your eyes. I had not read any other reviews or watched any YouTube videos (besides Jaclyn's) as I did not want my review to be influenced by anyone else. In this palette there are 35 brand new shades which took Jaclyn and Morphe two years to formulate. Now I have never owned a Morphe eyeshadow palette before so I don't know if the formula is different or not. I love the colour selection for this palette and think it is basically me in a palette, as I do wear warm toned eyeshadows on a regular basis but I do sometimes like to be a bit more colourful and use a brighter eyeshadow. 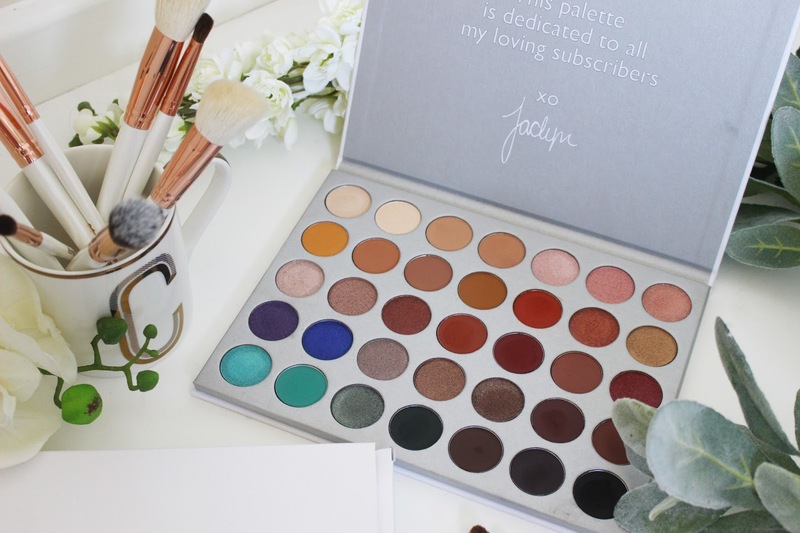 I usually would never buy a palette that is full of bright shadows because I know it would be a waste of money, so I am glad that Jaclyn has kept the palette fairly neutral and wearable, but has added the pops of colour to make everyone happy. There are five main finishes to this palette, matte, satin, shimmer, foil and glitter finishes which I love. I can see myself creating so many different looks with this palette, from natural to smokey to colourful. The packaging is really pretty, and I love the white and silver look which just makes it feel more luxurious. This is a cardboard packaging, but it does seem pretty sturdy and I think it would be great to take travelling as it doesn't open easily because of magnets. It is a larger palette but it is not too bulky, plus you are getting 35 eyeshadows meaning you have everything you need to create numerous looks. I do wish there was a mirror in this palette as that would just make this palette perfect for travelling. I do feel for the price you are paying there should be a mirror as you are paying another £15 on top of the normal price of Morphe palettes. Also the shade names are not printed anywhere on the palette, which does make it difficult to know what shades I am really loving. I do know that if you buy from Morphe there is meant to be a shade card included, but if you buy from BeautyBay that shade name card is not included at all (which they mentioned on their Twitter). However, you can go on the Morphe website to download the shade names, but it is a bit of a pain to do that. At first when I got this palette I looked at it and thought there were quite a few shades that were very similar to each other; Enlight and Beam, Silk Creme and M.F.E.O, Hunts and Roxanne and Chip and Central Park. There are also some other shades that look similar and I still think that Jaclyn could have replaced some of these shades with other shadows. I wish she had included a matte cream shade rather than having two shimmer cream shades. Of course the shadows are not identical to each other but they are similar in tone and I just think other shadows could have been used instead like a matte plum shade. This is going to be a palette for someone who loves warm toned shadows but likes to also experiment with colour sometimes. There are a few cool toned shades as well which I don't always use but it is so nice to have the option there if I want it. 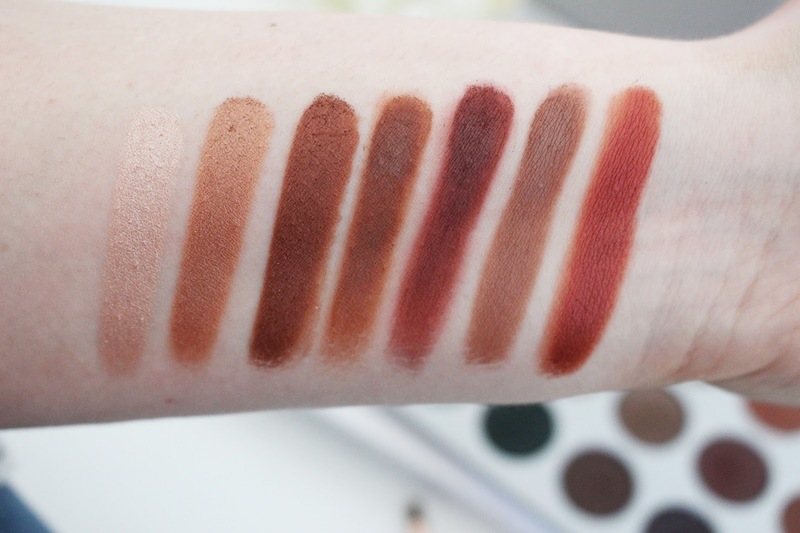 I love the shades and I think this palette is perfect for Autumn/Fall. The shadows themselves are so soft and buttery and they just glide so easily onto the eyes; you don't have to press hard into the pan to get colour payoff. Although they do apply better with a brush on the eyes than they do when you just swatch a shadow on your arm with a brush. I got almost zero fall out with this palette, so you can do your eyes after applying foundation and concealer without worrying about messing up your face makeup. Because the pigments have been pressed a lot more it does mean that you won't get as intense a pigmentation as a palette like the Modern Renaissance from Anastasia Beverly Hills. However, I found that these shadows were still really pigmented and you can use more of a heavy hand with this palette. I also found that I did not have to spend forever blending out the shadows as they are so easy to blend and I managed to create a beautiful look in five minutes. So this palette is perfect for anyone who is new to makeup. The metallic shades apply like a cream shadow and are so intensely pigmented that you can just use your finger to apply the shadow all over the lid. With the metallic shades a little goes a long way, I can pat my finger into the shadow once and it will cover my entire eyelid, so you do not have to pile them on to create a beautiful metallic finish. I can see this palette being my go to when I am in a rush and want a really pretty look but don't have thirty minutes to worry about blending my eyeshadow. I love the shades that have been included as the shimmer shades are so wearable and are perfect for the upcoming Christmas party season. I think my favourite shade out of the whole palette is the shade Royalty, which is this beautiful rich purple that will just look amazing all over the lid. I am not usually someone who likes to wear bright colours but I am definitely going to be wearing this shade at some point in the next couple of months. I also love the shimmer green shade called Diva which is this deep forest green shade that will suit so many skin tones. I also love how there are then the more wearable shimmer shades from rich bronzes, to golds, to champagne golds and then a couple of shades that have a pink undertone to them. I can see myself wearing this palette all year as the shades just work for any time of the year. The shimmer shadows in this palette are almost a foil when I apply them to my lid and they are so easy to apply; I only had to dip my finger in once to cover the whole eyelid. Also, I am definitely going to use a couple of the brighter eyeshadows for Halloween as they will look amazing for some looks I have lined up. My only criticism is some of the shades are slightly similar, but I can see that there are different undertones that Jaclyn has tried to use so this palette will be perfect for most skin tones. However, I do wish that one of the shimmer cream shades was a pure matte so I can set my primer or concealer with it and I wish that the shade Abyss was less patchy. Abyss is the matte black in the palette and I did find it a bit patchy when I swatched it plus it seemed to become a darker grey when I blended it out. I do love the matte shades in this palette and find them so easy to blend out so that there aren't any harsh lines and none of the shadows oxidised or changed colour when I blended them out besides Abyss which turns into a grey/black shade (but I just packed the shade on to make it more of a black. 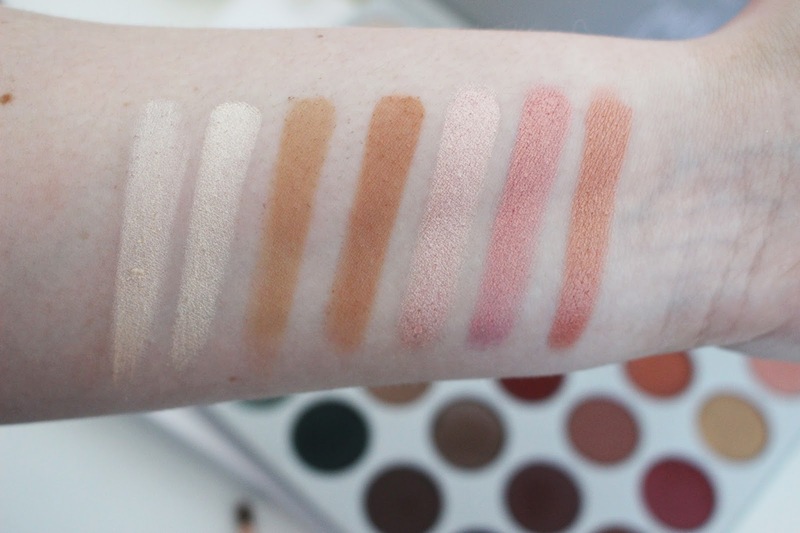 Jaclyn has also included so many transition shades in this palette and I love how there are more warm toned and a couple of cool toned shades that are perfect to use as a transition shade. 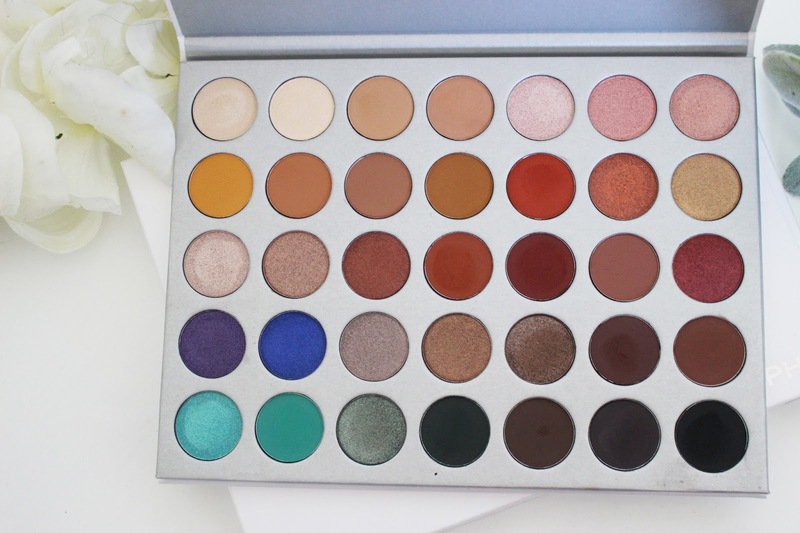 In this palette, there are 35 shades that Jaclyn Hill has added to make her dream palette. The palette itself is made up of warm toned shades from reds, chocolate browns and bronze shades, with a few pops of colour in matte, shimmer and metallic finishes. This really is a palette for anyone who loves rich warm colours that are perfect for the upcoming Autumn months. I will always swatch eyeshadow palettes on my arm with my finger by applying one to two swatches of each eyeshadow. If an eyeshadow does not swatch well, I will tell you and I did have to go back and forth with the matte shades in this palette to get a decent swatch, whereas the shimmer shades were done with one swipe. Often matte eyeshadows will not swatch as well as shimmer shadows but I was pleasantly surprised with how well these swatched on my arm. 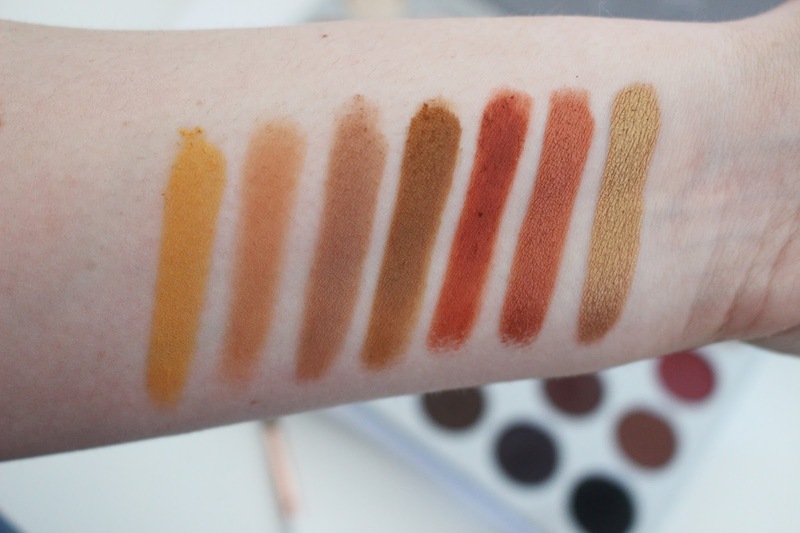 Like with any eyeshadow palette there were some shadows that did not swatch as well (especially some of the matte shades) and they looked slightly patchy when swatching with my finger or a brush. The shades that did not swatch well all seem to be the darker shades in the palette which was Enchanted, Central Park and Abyss. However, I did find that all the shadows perform well on the eye; even though when I used a brush to swatch some shades I got barely any pigment, but when I applied them to my eye they were so pigmented (I do not know why this is the case, so do not worry if your shadows do not swatch well when you first use them). With some of the shadows I could have easily added a primer or layered up the shades to get a really intense pigmentation but I thought it was only fair to show you how these shadows swatch with just two swipes. But like I said these do perform really well on the eyes. In terms of pigmentation, I am pretty impressed with the formula and the way that the shadows perform on the eye - I would say that this palette is not the most pigmented eyeshadow palette I own but it is definitely up there in the top ten. The eyeshadows are really pigmented, although when using the lighter shades in the top row I would suggest layering as they are quite pale and don't show up if you just lightly dip into the pan. However, the darker matte shades are really pigmented and you can use a light hand and then intensify the shade by layering it up; you can create a blurred, soft eyeshadow look or intensify it to make it more dramatic. The shadows are really soft and I found them so easy to blend out, even if you do end up picking up too much product on the brush. I did find it a lot easier to get a beautiful blended look when lightly dipping my brush into the pan and then blending the shadows out with a clean blending brush and layering up the shadow to achieve my desired look. The mattes are really pigmented, some are better than others, but I when I apply them to the eyes they are not patchy and look amazing. The Metallic shades are just out of this world are so creamy and are super pigmented. I just used my finger to apply the metallic shadows to my eyes and the result was so intense that I didn't have to go in with a brush and MAC Fix+ as my finger alone was enough. I absolutely love the warm fall tones in this palette especially the shades Hunts, Firework, Jacz and Roxanne. These are the shades I used today to create a warm fall look and they are so pigmented. I also love how there is no fall out with these eyeshadows. I was only lightly pressing my brush into the palette but there was no kick up. This is great as the shadows are pigmented but I don't have to worry about doing my eyes before my face makeup. I love how there are so many different shades that can be used to create so many looks; from natural, colourful, warm and smokey. I could see this as being a great palette to take travelling with you as you have so many possible looks with this one palette. My makeup routine is not complete if I do not use some kind of eyeshadow primer or concealer before I apply my eyeshadow. I feel like when I use a primer or concealer first that my eyeshadow just applies a lot easier and always blends out really nicely, whilst helping my eyeshadow to last a lot longer. It might seem like an extra step that is not worth it but I know that my eyeshadow always looks better when I have used a concealer and setting powder over my lids before applying any shadow. I did try this palette without primer and found that I got a similar result, although I did have to spend more time blending the shadows out and I did find that the eyeshadow started to crease after a few hours; whereas when I used a concealer underneath I had none of these issues. But the shadows were still pigmented, just the longevity was not as good. I did find that when I used a primer or concealer first, the shadows lasted a lot longer (which is great if you have a special occasion to go to where you need your makeup to last all day). It is very uncommon for me not to use some kind of setting spray or MAC Fix+ when I am applying a shimmer or metallic eyeshadow. I find that I get a much better application when I use a setting spray on a brush and it is a lot easier for the shimmer eyeshadow to stay on the lid and just help to make the shadow look really metallic. It helps to make the shimmer shadow really pop and stand out, whilst giving a foiled finish to the eyes. The shimmer shadows in this palette give a foiled effect when using MAC Fix+ and look amazing all over the lid. You could also add a concealer to the areas where the shimmer shadow will go to help the shadow to stick, however I find this step unnecessary as MAC Fix+ works well on its own. The shimmer shadows are not that intense when using a dry brush but when I used MAC Fix+ it just changed the way these shadows looked and gave a foiled effect. I did also find that just using my finger to pat the shadow all over the lid worked just as well but it gave a metallic finish rather than looking like a liquid foil. The simple answer to this question? YES. I do think this palette is worth buying, even if you are not someone who likes Jaclyn Hill. 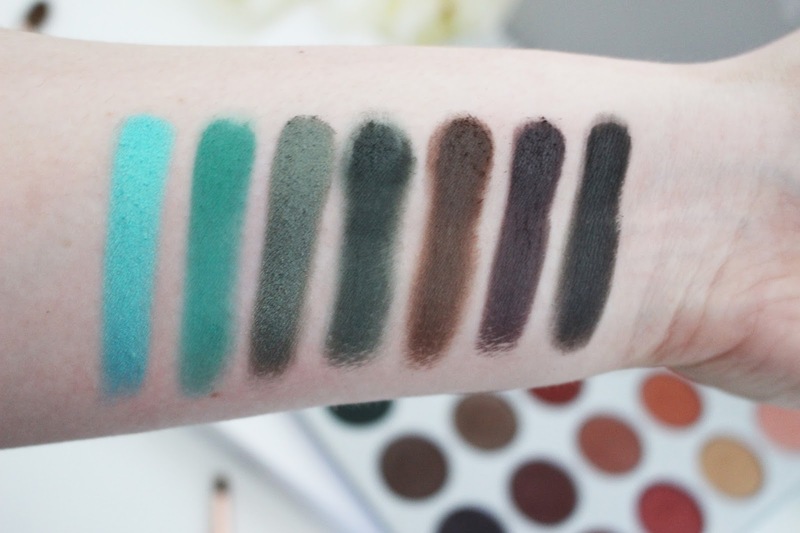 I cannot say whether the formula is the same as the other Morphe eyeshadow palettes but I know that the shadows in this palette are amazing; they are so creamy and soft, whilst still being fairly pigmented. Some of the shadows perform better than others but they are all so easy to blend and layer up the colour to achieve your desired look, plus there is barely any fall out. I am a massive fan of the shimmer shades in particular and think this palette is worth it just for those shadows alone. These are like a foil when used with MAC Fix+ and are perfect for the upcoming Christmas party season. This is predominantly a warm toned eyeshadow palette with a few cool toned shades and bright colourful shades. There are just so many different looks that you can create with this one palette, which I just love and it will suit quite a few skin tones. 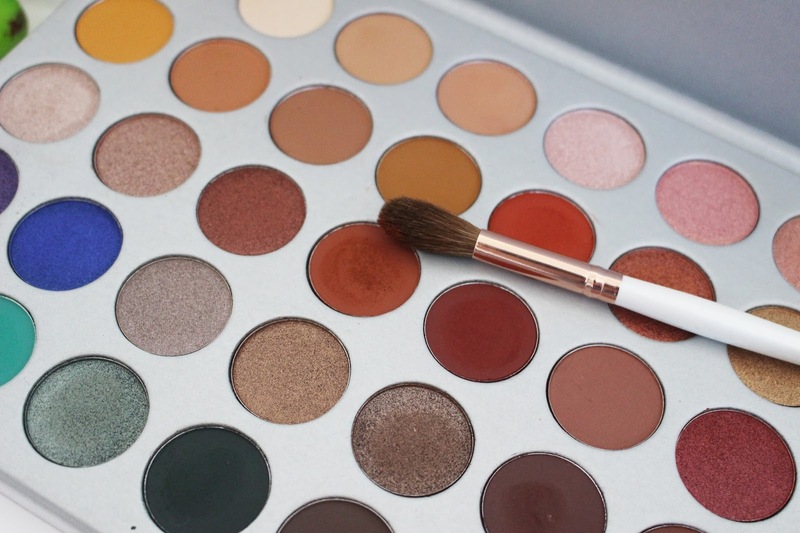 I think if you are someone who doesn't own much makeup this is the perfect palette to have as there are 35 beautiful shades that work well and will help you to discover what shades suit you the best. 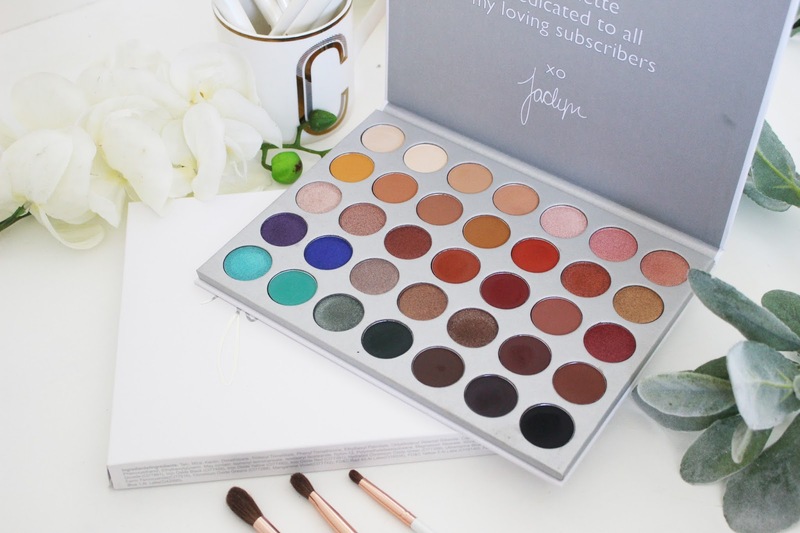 Whereas if you are someone who loves makeup and owns a lot of eyeshadow palettes then this will be something you will love because of the wide range of colours in one palette. Plus you can create a look in only five minutes which is perfect for those days when we are all in a rush to get out of the door but still want some makeup on. I do wish there was a matte cream shade in the palette and a mirror (especially as I am paying the same price as an Urban Decay palette) but I still love this palette. But I would recommend this to anyone, no matter what experience you have in makeup, as it is just beautiful and is so easy to use. Plus it will definitely bring you out of your comfort zone every now and again with the brighter shades. I know I will be reaching for this palette so much because I am always in a rush when I am doing my makeup and I don't always have half an hour to just blend out eyeshadow, so this palette will definitely be needed when I don't have much time to do my makeup. I am definitely going to look at the other Morphe eyeshadow palettes to see if they are just as good as this one. Also I wish that the price wasn't as expensive as it is, because other palettes from Morphe are only £22.50 for 35 shadows and this palette is £37 but you are getting some beautiful new shades. I just think that the price might put some people off as the other palettes are a lot cheaper, plus you don't even get a mirror in the palette. 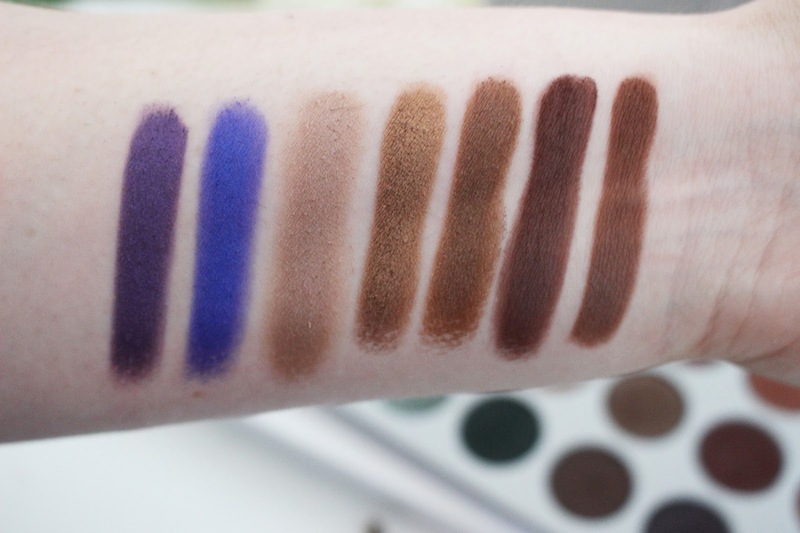 I think this overall is for people who don't own many eyeshadow palettes or for someone who is obsessed with makeup, as there are some shades in this palette that I can find in other palettes, but then there are some that I don't own at all like the blues, greens and purples. But it is handy to have all of these shadows in one palette so I don't have to get multiple palettes out when I am doing my makeup, so I do think this palette is worth buying! 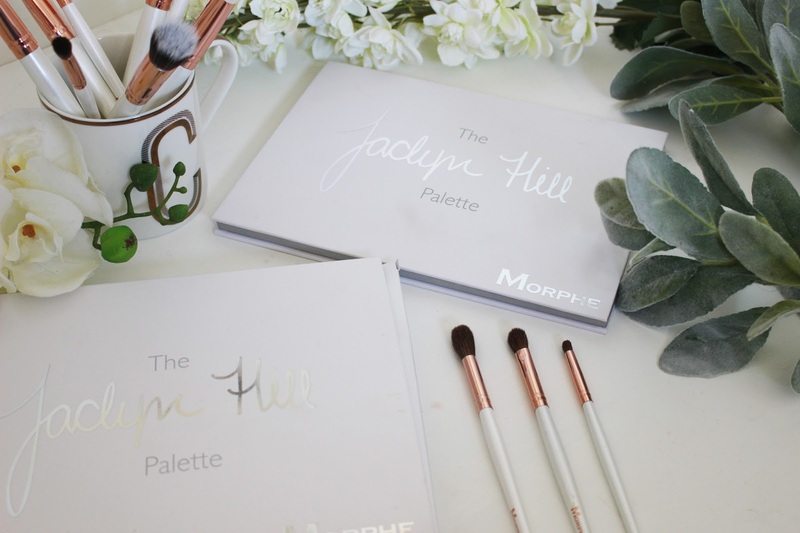 The Morphe X Jaclyn Hill palettes retails for £37 from BeautyBay (currently out of stock) or $38 from the Morphe Website. BeautyBay will be restocking the palette this month! 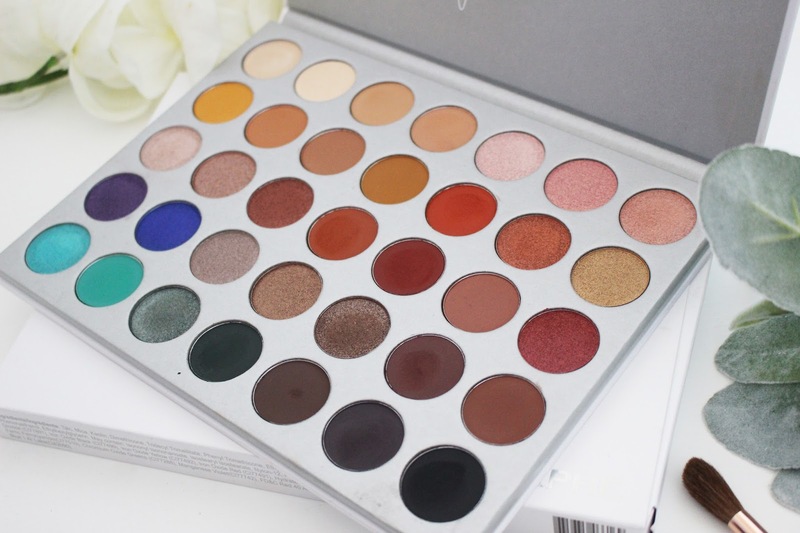 I would love to know what you think of the Morphe x Jaclyn Hill palette? 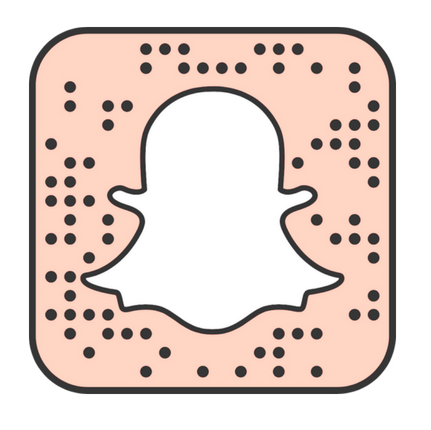 Labels: BEAUTY, BEAUTY FIRST IMPRESSIONS, BEAUTYBAY, Eyeshadow, Eyeshadow Palette, FIRST IMPRESSIONS, Makeup, Morphe, Morphe X Jaclyn Hill, Palette, REVIEW AND SWATCHES, WORTH THE HYPE?